Posted on May 21, 2015 by Sean K.
Barry just posted about a wonderful day he spent sketching and observing Field Sparrows at the Rocky Hill Wildlife Sanctuary in Groton, Massachusetts. Here is some background about their biology and natural history. Field sparrows are part of the New World Sparrows, in the order Passeriformes and in the family Emberizidae, which consists of about 320 species in 72 genera. Field sparrows typically eat both seeds and insects, relying on seeds in the winter and both insects and seeds in the Spring, Summer, and Fall. Field sparrows return in April from their over wintering habitat in Southern United States and Northern Mexico. Check out their range map. Males are territorial and will set territories at farmlands, old fields, and other open habitats. Field sparrows typically lay eggs once or twice in a season, but may lay a third if their first brood fails. Nests will have anywhere between 1 and 6 eggs. Field sparrow nests are usually made out of grass and twigs, either on the ground or just above the ground and have been found in Goldenrod, Multiflora Rose, and in other shrubs. Early season nests are typically on the ground or close to the ground, while later season nests will be higher in shrubs and trees to better avoid ground predators. 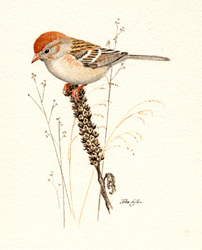 Field sparrows nest in habitat that is associated with old fields, farmlands, and prairies. Because of their close association with farmlands, the field sparrow population in Massachusetts is experiencing declines due to the decline in farmlands and old field habitat coupled with an increase in housing development in the suburbs. Decline in grassland birds has been well documented by Mass Audubon’s breeding bird atlas. This entry was posted in Natural History and tagged Birds, Emberizidae, field sparrow, grassland birds, Groton, nesting, Rocky Hill Wildlife Sanctuary on May 21, 2015 by Sean K..